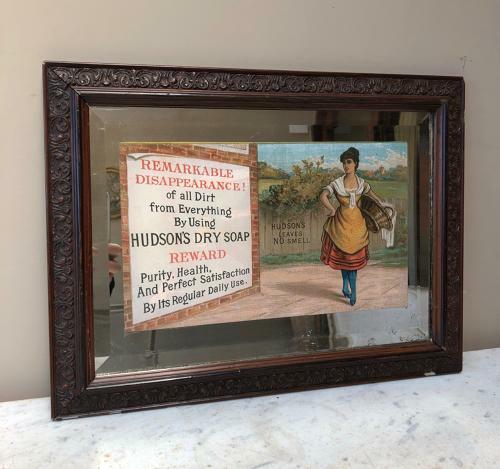 Rare & Superb Condition Advertising Mirror for HUDSONS DRY SOAP. Wonderful condition....very slight foxing but all good. Been in this frame for years!! The Hudsons lady to the right with her wash basket and to the left "REMARKABLE DISAPPEARANCE! of all Dirt from Everything By Using HUDSONS DRY SOAP. REWARD Purity, Health, And Perfect Satisfaction By Its Regular Daily Use. Centrally HUDSON'S LEAVES NO SMELL. A lovely item & nice to display anywhere.